Three articles from three cruises highlighted here! Atlantic waters have been recently recognized to play an increasing role in reducing sea-ice extent in the Arctic Ocean at a rate now comparable to losses from atmospheric thermodynamic forcing. Beyond the Arctic Ocean, the water mass transport and transformation processes in the North Atlantic Ocean substantially contribute to the Atlantic meridional overturning circulation (AMOC). Artificial radionuclides can be used as transient tracers that provide crucial information on pathways, timescales and processes of key water masses that cannot be obtained from hydrographic properties alone. In particular, radionuclides released from the two European Nuclear Reprocessing Plants, have proven to be specifically useful to trace the circulation of Atlantic waters into the Arctic and sub-Arctic oceans. Within this context, the three recent articles by Castrillejo et al. (2018), Wefing et al. (2019) and Casacuberta et al. (2018, see references below) describe the journey of the two long-lived anthropogenic radionuclides iodine-129 (129I; T1/2=15.7 · 106 y) and uranium-236 (236U; T1/2=23.4 · 106 y) from their sources through the Arctic Ocean and into the North Atlantic Ocean. Each paper corresponds to one GEOTRACES expedition that took place between 2014 and 2016 in the North Atlantic Ocean (GA01 section), Arctic Ocean (GN04 section) and Fram Strait (GN05 section). Main results show that the combination of 129I and 236U serves very well to identify the different Atlantic branches entering the Arctic Ocean: Barents Sea Branch Water (BSBW) and Fram Strait Branch Water (FSBW). Due to the uneven mixing of 129I and 236U from the two European Reprocessing Plants of Sellafield and La Hague in the North Sea, each branch brings a different 129I/236U ratio. Furthermore, this ratio allowed identifying a third Atlantic branch evolving from the Norwegian Coastal Current (NCC), that stays within the upper Polar Mixed Layer and carries a significantly larger proportion of 129I and 236U releases from the European reprocessing plants compared to the FSBW and the BSBW. The evolution of the NCC with a strong 129I and 236U signal is further observed when it returns to the Atlantic Ocean as Polar Surface Water (PSW) in the Fram Strait. This allowed estimating a transit time of 15-22 years for the PSW flowing through the Arctic Ocean. 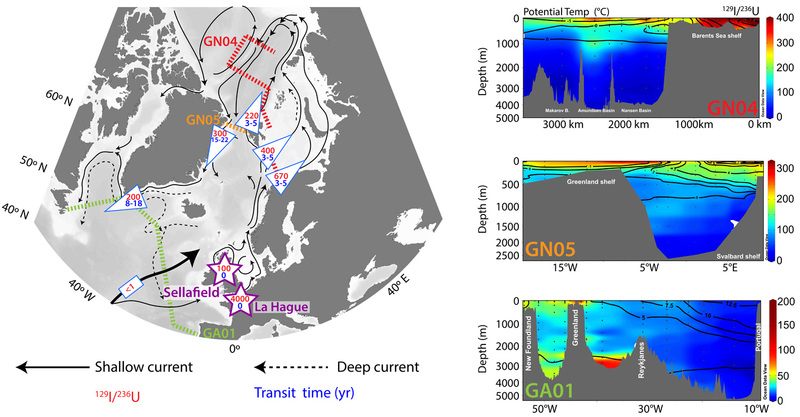 In the subpolar North Atlantic Ocean (SPNA), an increase of 129I was observed in the deep overflow waters in the Labrador and Irminger Seas, confirming the major pathways of Atlantic Waters in the SPNA that were previously suggested by other authors: a short loop through the Nordic seas into the SPNA (8-10 years) and a longer one, which includes all the way through the Arctic Ocean (>16 years). The output of these works proves the potential of using 129I and 236U as a tool for investigations on the circulation within and exchanges between the Arctic and sub-Arctic Seas. Figure: (Left) Map showing the main Atlantic water circulation in the North Atlantic and Arctic oceans (black arrows). Dashed lines represent the three GEOTRACES sections sampled between 2014 and 2016: North Atlantic Ocean (GA01), Arctic Ocean (GN04) and Fram Strait (GN05). Both 129I and 236U are released from the two European Reprocessing Plants of Sellafield and La Hague (purple stars). Blue triangles represent the 129I/236U atom ratios (in red) at sampling time and the transit time of Atlantic waters (in blue) from their source in the North Sea, to the sampling location. (Right) Section plots of 129I/236U atom ratio in the three GEOTRACES sections, with black contour lines representing potential temperature. Click here to view the image larger.